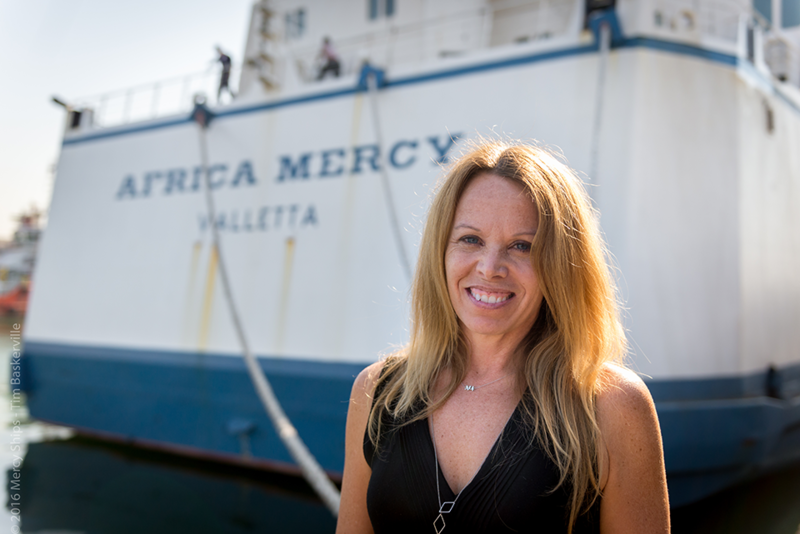 CSUN professor and alumna Michele Mega ’01 (M.A., Communication Studies), communications director on the Africa Mercy hospital ship, where she volunteers with nonprofit Mercy Ships. Photo by Timmy Bakersville, courtesy of Mercy Ships. Imagine packing up the life you knew to travel to the other side of the globe and serve people in some of the world’s poorest countries. Your new home is a ship, and your ports of call are African cities. Your mission is to help residents who lack basic access to safe, timely and affordable health care. For Michele Mega ’01 (M.A., Communication Studies), this is her everyday life. Mega, a professor and communications professional, is volunteering her time to help connect those in need to life-saving surgeries onboard the hospital ship Africa Mercy. She has taken a leave of absence from her teaching career of 16 years at California State University, Northridge to serve as a volunteer with the nonprofit organization Mercy Ships. “It’s an honor to meet the patients and their families,” Mega said. “I’m always humbled at how they entrust their lives to us. Some have never seen a doctor before, or been on a ship … that they will journey for days to find us and then trust us with their well-being in such a vulnerable state really astounds me. CSUN communication studies professor and alumna Michele Mega ’01 (M.A., Communication Studies) speaks with Valerie, a Mercy Ships patient. Photo by Justine Forrest, courtesy of Mercy Ships. In July, Mega traveled back to the Africa Mercy, which will set sail this month to its next port of service in Conakry, the capital city of Guinea, West Africa. The ship will spend 10 months docked in Guinea providing surgical services, dental care and medical training to thousands of people. Mercy Ships is an international, faith-based organization that provides free health care services to people in third-world countries. The services they provide are life-saving operations: cleft lip and palate repair, cataract removal, orthopedic procedures, facial reconstruction and obstetric fistula repairs. The organization uses ships that function as floating hospitals, docking in various ports for several months at a time, to transform lives. According to the organization, its flagship, Africa Mercy, is the world’s largest non-governmental hospital ship and is dedicated to serving the continent of Africa. An average of 1,000 volunteer crew members from up to 40 nations serve onboard the Africa Mercy each year. The ship is equipped with five state-of-the-art operating rooms, where the operations are provided free of charge to all patients. Around 2007, Mega was attending a church service when she heard a presentation by guest speaker Dr. Gary Parker, Mercy Ships’ chief medical officer and a maxillofacial surgeon. The before-and-after pictures he showed of patients in Africa moved her deeply, Mega said. She wrote to Parker directly and started supporting him. Africa Mercy patient Valerie, before (left) and after she received surgery. Photo courtesy of Mercy Ships. In 2015, after about eight years as a donor and receiving the organization’s mailers, Mega decided it was time to volunteer. She took a leap of faith and decided to devote most of her summer to volunteer with the organization, serving food in the Africa Mercy’s dining room. She loved that first experience so much that she returned to the ship in January 2016 to serve for a longer stint in the Communications Department. She was inspired to follow the example of Jesus Christ, she said. At CSUN, Mega has taught nine different courses in the Department of Communication Studies, including Advanced Public Speaking, Intercultural Communication and Small Group Communication. Mega serves as the communications director and on the senior leadership team on the vessel. As a volunteer, she must pay her own way to live on the ship. She has a support system back home that helps provide her financial assistance so she can be gone for long periods of time. Mega’s family and friends donate money to help offset her room, board and travel costs, she said. Her background as a communication studies professor gave her a fitting skill set for the volunteer work onboard, she said. The entire volunteer crew aboard the Africa Mercy must pay full expenses in order to give their services to those in need. Mega volunteered for several organizations before joining Mercy Ships, including Meals on Wheels, which provides food to those who are unable to go grocery shopping; Chrysalis, an organization that provides employment services for those in economically disadvantaged areas; and helping with building projects in Mexico and South America. Mega has had the blessing of professor Kathryn Sorrells, former chair of CSUN’s Department of Communication Studies, who has supported and approved her leave of absence from teaching. The department will continue to support Mega, and her colleagues consider her an inspiration, Sorrells said. “We need to applaud Michele for her commitment and awareness of helping others. It benefits her, but it also benefits the cause that is much bigger than her,” Sorrells said. Communication studies professor Randi Picarelli said that Mega’s volunteer position as Africa Mercy communications director seemed meant for her. “It’s such a wonderful fit for her, and when she was offered the position as communications director, it was like all the elements of Michele were coming together,” Picarelli said. Though working with Mercy Ships has been an amazing and life-changing experience for her, Mega said she misses her job as a professor and especially being with CSUN students — and she hopes to come back to teach in fall 2019 or 2020. 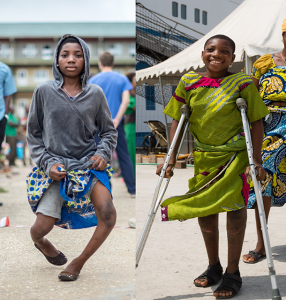 For more information about Mercy Ships, visit https://www.mercyships.org.